Life Is A Munchkin Picnic This Summer! Munchkin is one of my favourite brands, with a whole host of items that are useful in everyday life, they also bring the fun factor to the necessity. Recieving my latest bundle from Munchkin, I was in love instantly! 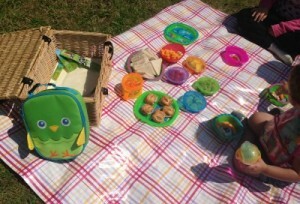 I love a picnic, and a picnic with my babies is even better. The picnic basket got me hooked, I adore it! So what was inside? Here are some of my favourite items…. Well, firstly I have to rave about the Bento Box. I am a massive fan of Bento lunches for Emma and Mark. Emma isn’t a fan of traditional sandwiches, and will pick the filling out and leave the bread. So instead I like to fill it up with snacky bits, grapes carrot sticks, salad, mini sandwiches, crisps etc. The thing that makes this so much better than your average lunchbox, is the compartments, the lid and the fact it has a handy slot for cutlery (which comes included!). 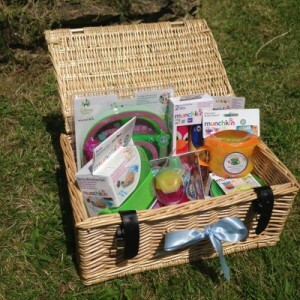 It is my most favourite Munchkin product at the moment…..and Emma’s too. Crumb Catcher Bibs. 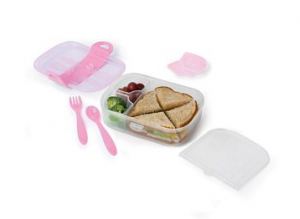 A pack of two, these are great for toddlers and weaning babies. They are plastic material, so no wet tops underneath. They have a crumb catcher, and even a little tie so you can wrap them up and shove them in your bag, taking up no room at all. The velcro neck fastening is fab, strong enough and comfortable enough so they aren’t too tight. Oh and the designs are super cute, what more could you want? 4 Fresh Bowls and Lids. These are in bright colours, and are perfect for taking out and about. They have lids which co-ordinate, but I love mixing it up a little and doing a mismatch of colours. They are brilliant for filling with a variety of food, food that everyone can enjoy. Of course they are microwave safe, freezer safe and dishwasher (top rack) safe too. These are brilliant investments that will be great for weaning, until, well adult hood, if you don’t steal them off your child first that is…. Munchkin have a whole host of amazing products that you will love I’m sure, check them out online, and in all good retailers such as Amazon, TESCO, Asda and Boots.